The Cape Coral Police Department is the only law enforcement agency from the United States that is a finalist. The other agencies are the Reykjavik Police, Iceland and the Saanich Police, British Columbia, Canada. The winner will be announced at the September 25th SMILE (Social Media In Law Enforcement) Conference in Omaha, NE. ConnectedCOPS.net is an organization dedicated to providing law enforcement agencies across the globe with resources and information in the realm of social media. "Congratulations on being recognized by your peers in law enforcement social media arenas. Being the sole U.S. law enforcement agency nominated speaks volumes about the hard work and dedication you have put forth to make this a success. Looking back on where we were before we began this journey and comparing it to our position in the community today and I can say without reservation that the social media platform you designed for this agency has produced exceptional results. The immediacy by which we share important information with our residents and members of the media and in turn the relationships and trust that have developed with them has been instrumental in us regaining the trust and full support of the community. Your effort in ensuring we achieve our Community Governance desired outcomes has been instrumental in this area and for that I thank you on behalf of every member of this community"- Jay Murphy, Chief of Police. 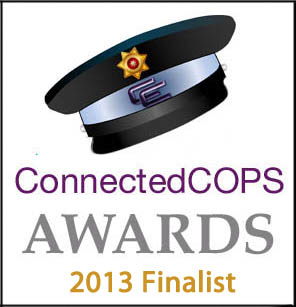 For more on the award, and ConnectedCOPS.net please visit the link provided.